Nabil Benandellah, Morocco's Minister of Communication and government spokesperson, said on Thursday that the anti-monarchy statements of the Islamist activist Nadia Yassine oppose the "deep beliefs of the Moroccan nation." Yassine's trial is scheduled for June 28, official sources said. Nadia Yassine, daughter of Abdessalam Yassine, the spiritual leader of the Islamist, outlawed movement "Al Adl Wal Ihsane" (Justice and Charity) was summoned on June 3 by the judicial police at the request of the Prosecutor of the Rabat first instance court. Yassine stated in an interview published by Al-Ousbouaaya al-Jadida that she prefers a republic regime in Morocco and that Monarchy is not suitable for the country. Yassine and Abdelaziz Gougass, editor of the newspaper that published the front page interview, will appear at a Rabat court on June 28. 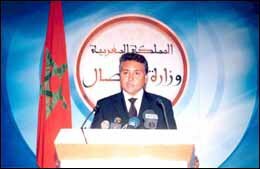 Director of Aujourd'hui le Maroc daily, Khalid Hachimi Idrissi, was also subpoenaed on Friday by the judiciary police. Hachimi, was summoned following the publication by his newspaper of statements by Fathallah Arsalane, spokesperson of the outlawed "Al Adl Wal Ihssane" movement, backing Nadia yassine. "It is natural to have recourse to justice when the provisions of the constitution are violated," said Nabil Benandellah, communication minister, in a press briefing. Benandellah, commenting on the publication of Yassine's interview, said that "the press code is clear and defines responsibilities of people who make statements, those who publish them, those who print them and those who distribute them." Earlier last week, the Moroccan press denounced Yassine's statements, saying that they are evident of her ignorance of the importance of monarchy, stressing that the latter was chosen by Moroccans for centuries.